Promote your salon! Perfect cape to get your salon noticed and talked about on social media. Inspire your client to take a selfie “Before and After” photo and post it on social media/share with friends on facebook… Instagram or Pinterest. 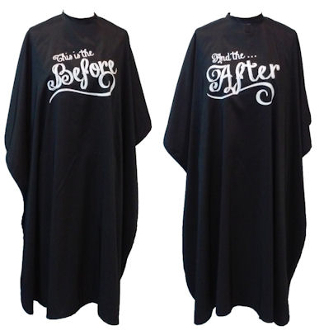 Show off your salon’s abilities with this Before and After cape. Cape has “Before” graphics on one side and reverses to “After” graphics on the other side. Everyone loves a dramatic Before and After story…. Create your own hashtag and post all of your Salon Before and After photos to inspire new cuts, color or techniques. This beautiful professional cape is cool and comfortable Classic DuraSilk material. Durable, Bleach resistant, water and chemical resistant. Adjustable snap neck closure.